Late night isn’t what it used to be. Besides the fact that most people are just watching the highlights online, there’s just way too many hosts and way too many shows to choose from. During the 11 PM hour, I have to choose between Jon Stewart, Stephen Colbert, and Conan O’Brien, who are all personal heroes of mine. Two weeks ago, Comedy Central kicked off “@Midnight,” which proved to be a surprisingly smart and fun way to combine TV and social media into a game show format. There’s a reason that Chris Hardwick now hosts everything ever. Then one week later, “The Pete Holmes Show” premiered on TBS at the exact same time. After two or three episodes, I was sold. Granted, I was already a huge fan of Pete Holmes through both his standup and his podcast “You Made It Weird.” Holmes’ standup is endearingly goofy and consistently sharp in its observations. “You Made It Weird” focuses on a loose conversation that is funny and enlightening and often pushes the three hour mark. Holmes is both one of the most talented stand-ups working today, and host of a podcast that is often better than some of its more well-known contemporaries. In his new show, Holmes takes both his skills as a comedian and his skills as a great conversationalist and shoves them into a half hour that is abundant with jokes that never feels rushed or crammed in. Normally, it takes a late night host a while to get settled in. Just ask Conan, who serves as this show’s executive producer. However, Holmes already looks like he has the gist of it after just a little more than a week on the air. That’s probably because this is Pete’s show. He built it from the ground up (with a little help from his friends) and then put his name on it. There is no legacy that he has to preserve. With that pressure off, all he has to worry about is being funny. After all, that is his job. Because of this sense of freedom, Holmes has quietly been tweaking with the late night format while also showing great respect for it. 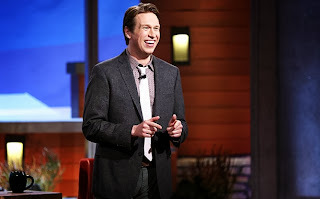 Unlike most late night shows, “The Pete Holmes Show” always opens with a pre-taped sketch. Lately, he’s had multiple parodies of James Bond and X-Men. Neither of these things are that relevant to pop culture at the moment, but who cares. It seems wrong to make jokes about something over a year old, but the bits are so funny that the time that they air seems irrelevant. After the opening credits, its naturally time for the monologue. Instead of firing off a bunch of one-liners about the day’s current events, Holmes instead does a few minutes of stand-up. One night, he might tell a long story about going to an Enrique Inglesias concert. Another night, he might go on a rant about farmers and Daylight Savings Time. You never know. What is beautiful about this is that Holmes is bringing unpredictability back to late night. And of course, the show ends with an interview. Just like the monologue, the interview format can change from episode to episode. One episode last week featured a pre-taped interview with Allison Williams in which they sat in their pajamas and ate ice cream. When guests come on, they rarely discuss the products that they are actually there to promote. Holmes incorporates the laid back and friendly atmosphere on “You Made It Weird” into his TV show and makes his interviews unforced and fun. Analyzing the reason why a certain joke is funny tends to ruin the joke. However, I will say that “The Pete Holmes Show” fully embraces the philosophy of comedy, especially improvisation. Pete Holmes always has the attitude to just go with it, and when he accidentally goes off script (which he does a lot), or laughs at his own jokes (which he also does a lot), he embraces the “yes, and.” This can sometimes be disastrous, but because Holmes is so naturally funny and quick on his feet, he can always turn an awkward moment into a fun and hilarious one. “The Pete Holmes Show” clearly comes from somebody who loves both comedy and late night television more than most people. It is with this knowledge that he is able to move the format forward. He can play with conventions without being sarcastic or mean. As Holmes has stated on his podcast, people enjoy a monologue and an interview because the familiarity of it is comforting. “The Pete Holmes Show” is not radically new but rather a much needed breath of fresh air. You can tell how different “The Pete Holmes Show” is just from the look of it. The set is decorated with paintings that look like they come directly from the walls of NerdMelt, one of America’s best alt-comedy venues which happens to be inside a comic book store*, and perpetuates the “we’re all in this together” comedy mentality. Pete doesn’t even need to wear a suit to show you that he knows what he’s doing. Ladies and gentlemen: the new future king of late night wears Converse. *NerdMelt is located inside Meltdown Comics on Sunset Boulevard in Los Angeles. If you live in LA and have never been to a show there, go as soon as humanly possible. This entry was posted in Analog This, Chris Hardwick, Conan, Conan O'Brien, Late Night, Meltdown Comics, NerdMelt, Pete Holmes, TBS, The Pete Holmes Show, You Made It Weird on November 5, 2013 by ian0592.